Join us on the 14th April for an exhibition of work by young people on human rights around the world. This event will showcase work from a recent competition, the HART Prize for Human Rights, which attracted many diverse entries from across the UK and beyond. We will be exhibiting a selection of the most striking, thought-provoking pieces, including paintings, collages, films, photographs, poems and short stories. The exhibition will also include photographs and information from our partners around the world, providing an intimate insight into human rights issues; particularly those which are missed in the mainstream media. 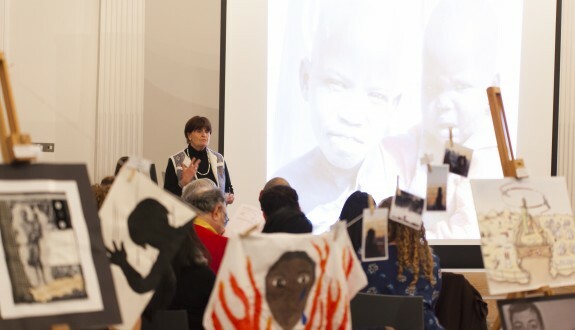 The exhibition will offer new, creative perspectives on human rights in Burma, India, Nagorno-Karabakh, Nigeria, South Sudan, Sudan, Timor-Leste and Uganda, and will celebrate the work, passion and commitment of young people. There will be a presentation by Baroness Cox, and we will be announcing the winners of the HART Prize for Human Rights. All are welcome – please RSVP to anna.cox@hart-uk.org.